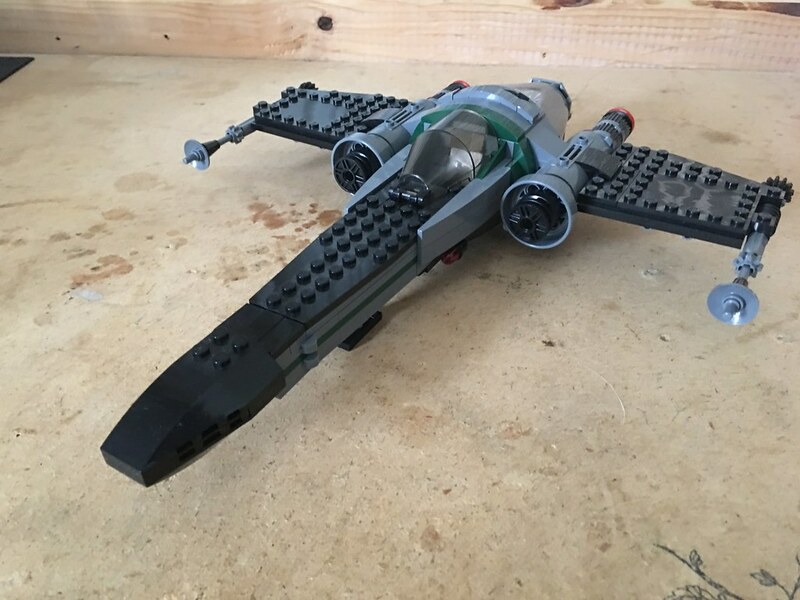 Since everyone is building X-wings, why not build something similar but less well known? 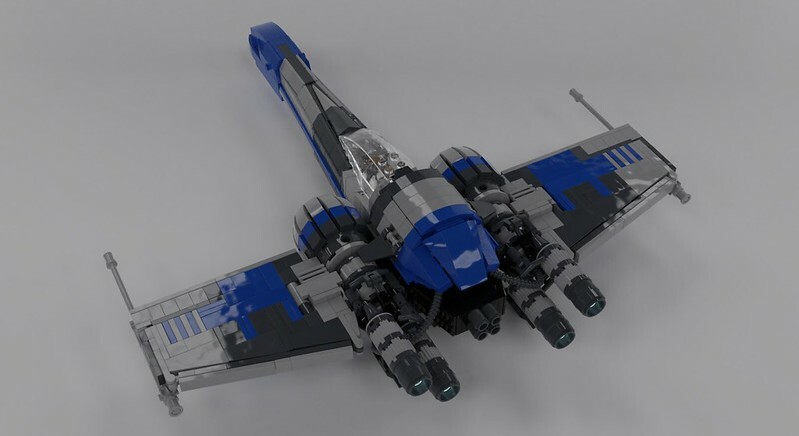 The Z-95 Headhunter is one that has many variations both in Canon and Legends, the most notable ones being the "X-wing without the S-foils" and that really ugly one shown in The Clone Wars series. I was influenced by various maquettes and illustrations of a Z-95 with the big engines. My take on the starfighter is that it's a newer model produced in the post-ROTJ era, with influences from its distant cousin, the T-70 X-wing. There are more pics at the flickr album and may post more. i had to look several times to recognize that the first image is not a reference picture but it really contains your model. Jawdropping :D The design is pretty incredible (particularly that use of the long dual grey spike piece which you matched perfectly with the colors of the nose). I have to say that eventhough this is somehow less eye pleasing in-universe design for me, your model makes up for it. That looks cool! The engines look really good! I believe 90% of it is perfect and the rest is not. Thankfully, that "rest" area is only the nose cone, which looks bulky and heavy. I know this might be caused by the nose generally not sloping towards the front, but it still should be fixable, maybe by adding this piece in front of the 2x4 curve would help? (and obiviously making rest of the nose cone match this). Aside from this? Fantastic design. What not to like. The nicely sloping nose on multiple planes. Interesting wing colour pattern. Very well done engines which totally won't be shamelessly stolen for a design which totally is not upcoming one day. And you picked one of better looking z-95 variants! Awesome looking model, I also love the use of the spike piece which I've not seen since 2009 in 8015! I agree with @Jerac, everything is perfect aside from the nose cone. If you find a way to fix this, count me in to pay for the instructions of this bad boy. The design is pretty incredible (particularly that use of the long dual grey spike piece which you matched perfectly with the colors of the nose). I have to say that eventhough this is somehow less eye pleasing in-universe design for me, your model makes up for it. I'm surprised that not many people integrate the Exo-Force spike piece into angled hulls. Maybe all the weird colors are a turn-off? 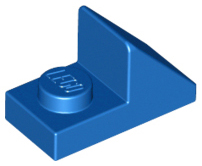 Either way, an upcoming LEGO Architecture set has it in completely LBG which may be useful for Star Wars MOCs. You're right about the nose, I'm not happy with it. It's always the hardest part to get accurate and good looking, even on X-wings. I'll try to experiment with fixing the nose with your suggestion. Maybe make it smaller, since that part really is too big. And by all means, do shamelessly steal the engine design. I didn't invent the technique, though I don't see many builders using it. I stole it from the wooden water tank from LEGO's own 10246 Detective's Office and first used it in my Hungarian Parliament MOC. It's really a good way to make round shapes and I hope it gets popular. And the Z-95 really is an ugly starfighter, but I have a soft spot for it. It's commonly used in the EU for its simplicity and versatility. It's like the Honda Civic of the Galaxy. 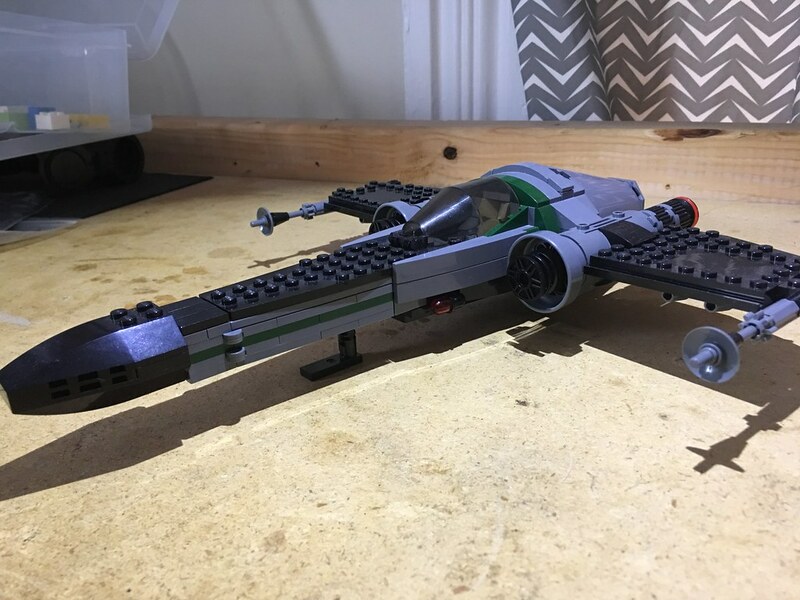 I still prefer the "boneless X-wing" look of the original vs. the version that appeared in The Clone Wars (an abomination imo) so I made mine based off Fanon variants. I should credit this fan model since it was my main inspiration. Z-95 really is an ugly starfighter, but I have a soft spot for it. It's commonly used in the EU for its simplicity and versatility. It's like the Honda Civic of the Galaxy. I still prefer the "boneless X-wing" look of the original vs. the version that appeared in The Clone Wars (an abomination imo) so I made mine based off Fanon variants. I should credit this fan model since it was my main inspiration. Isn't it absolutely beautiful? I will definitely try this one in LEGO one day! That is gorgeous! One of my inspirations for this MOC. I do hope Z-95s appear in Star Wars Canon again, with something more akin to this and not whatever those things from The Clone Wars are supposed to be. 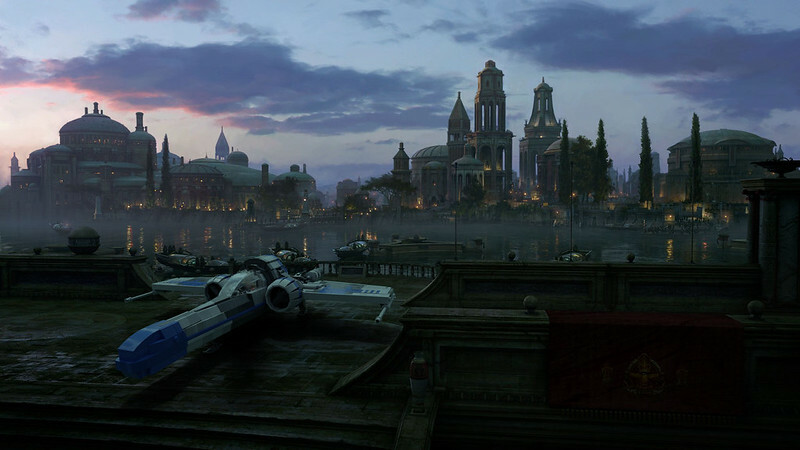 And I can't wait to see your take on this starfighter, I have no doubt it will be amazing! This looks amazing! The wings are perfect with the colors and patterning. The angles on the front fuselage too. I am a big fan of the z-95. The old cannon now legends basically held that it had been around so long and there were so may almost any version could exist. That why I've been tinkering with one for a while now. I can decide on 2 large engines or 4. Go for it! There aren't enough Z-95 MOCs anyway. Maybe you could combine 2 and 4 engines, like how I saw someone on Reddit do it. They built it similarly to the LEGO's official T-70 engine assembly (vehicle mudguards) and stuck two wheels inside them. I thought it looked cool, you could mess around with that. 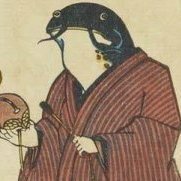 Right now I’ve settled on something similiar. I built in two large round pieces at the front and then on engine in the back with two smaller boosters. I took some quick shot hard to see the smaller boosters. I used the same technique on the front nose as most of the official x-wings but I shortened it and thinned it down. I wanted it to be a little smaller than an X-wing. I want to try a four engine style and maybe a two seat trainer version as well. I started work on a two seat trainer/heavy version too. 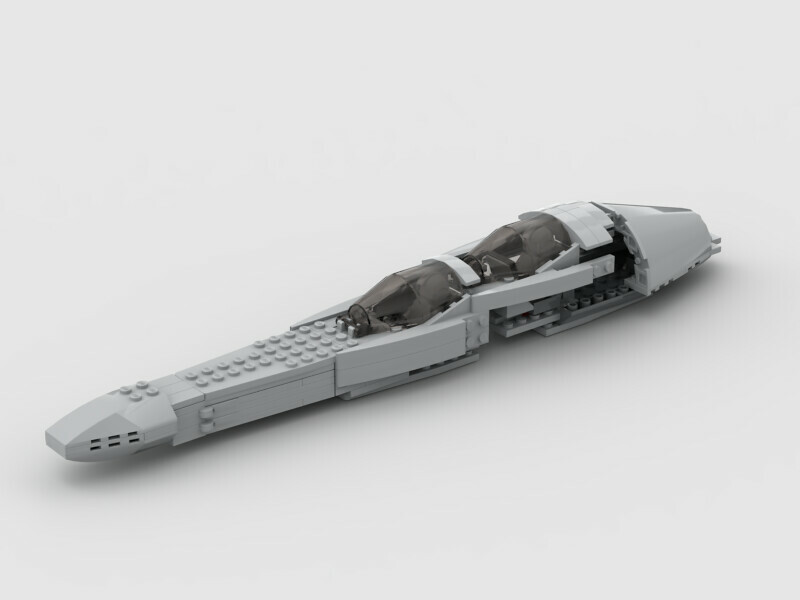 And speaking of two-seaters, I originally started this MOC as a build of this X-wing concept for The Force Awakens. I just love how the engines don't split open, kinda like the ARC-170s. As for the wings I will be going a little larger to match the larger hull. If you have the wing space you may as well fill it up with missiles too. Originally i wanted to do a two person cockpit like that X-wing just could not find a suitable canopy. I decided to on double cockpits like the ARC-170. Figured InCom could market this version as a cheaper alternative to the 170. I've been messing around with engines and once i get a good quad version I will rebuild the original. I figure in universe the Z-95 would be the bargain fighter and to keep costs down InCom would reuse components on multiple versions and offer different versions on the same basic hull. I want them to have the same cannons engines and etc. That way they would share training and replacement parts just like a trainer would. I'll also adjust the colors to match each other. I have a few random mini figs I've put together from random bits that will be my mercenaries that fly these. 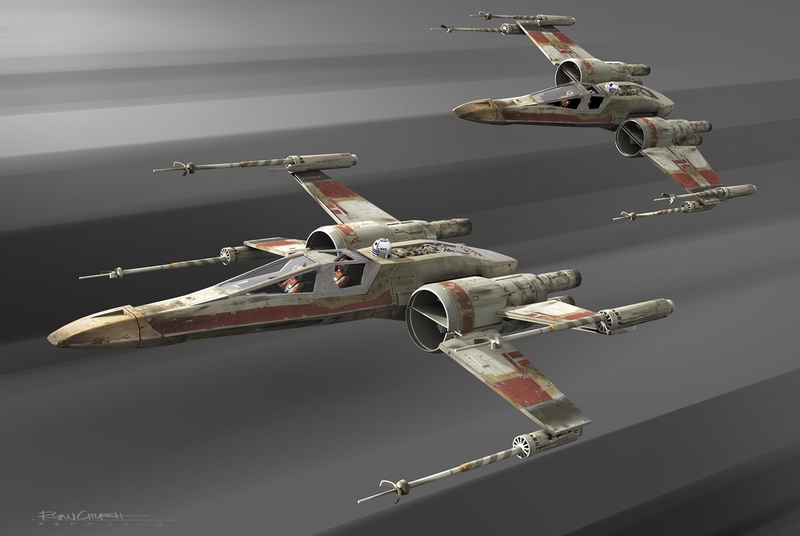 The Z-95 is the Honda Civic of the Star Wars universe. It's not explicitly stated in canon, but come on. It's pretty obvious that it's the sturdy and affordable spacefaring vehicle. Holy hell, this only took three weeks? You made the most of the time, great job. 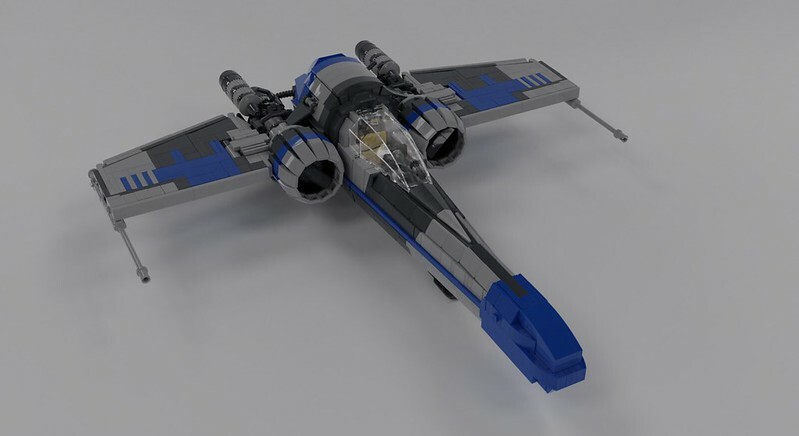 As with your TIE bomber, the color blocking is amazing, I especially like your use of part 61406pb03 on the nose with the coloration, it's superb. I like how chunky and blocky the ship looks, as a precursor to the X-Wing I always liked bulky Headhunters, which you nailed! The reactor space behind the cockpit is flawless as well, and your engines rock (one intake to four exhausts is really fun). I checked out the rest of your pics on Flickr, the cockpit is off the chain, i LOVE the joystick you made! Seriously one of the top cockpit detailing I've seen. The underside is so smooth, and the landing gear is great! Does it really support its own weight? 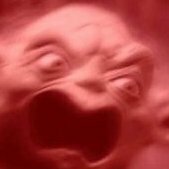 I usually try to offer some criticism, but honestly I can't find anything. I love the build. I checked out the rest of your pics on Flickr, the cockpit is off the chain, i LOVE the joystick you made! Seriously one of the top cockpit detailing I've seen. The underside is so smooth, and the landing gear is great! Does it really support its own weight? One day, I will build all my digital MOCs with actual bricks. I would assume the landing gear supports the ship. 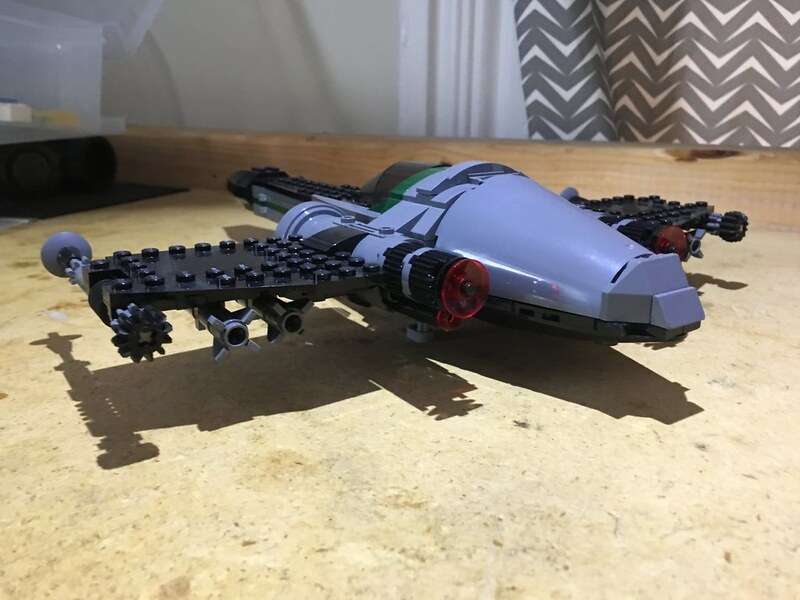 It's only about 1100 pieces, and plenty of other MOCs like this have been supported by similar landing gear. The cockpit was the hardest part especially with the angles. Right in front of it is an internal structure of all kinds of supports for the exterior elements with multiple angles so space was limited. I was happy to add the joystick and console tiles. This is really amazing. The intakes are so pretty.